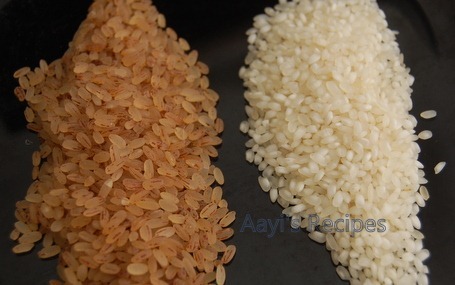 Few months ago, I bought a bag of boiled rice (ukdo tandul/Kerala matta rice) – the brownish colored boiled rice. V and I both enjoy the congee (pej) made of this rice. The problem is, we only get 10-20lb bags of this rice here. We don’t eat congee very frequently these days, so I needed another way of using this. So I have been making few different dishes with it. Since Ishaan loves the appe, I have been making these very frequently. I like this slight variation of regular appes. 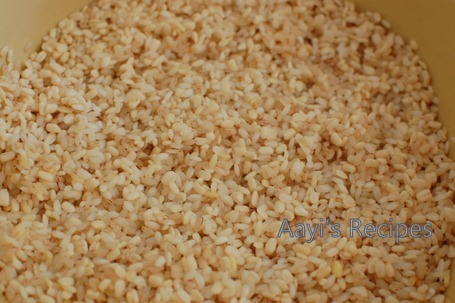 Soak urad dal, both kinds of rice, methi seeds in water for about 2hrs. Grind them to a smooth batter. Soak poha in water and squeeze out water (I forgot to take a picture of this). Add this to batter and grind again. Add sait. Just before making appe, add onion to the batter. Make appes. I served it with onion-coconut chutney. Following is a picture of ukdo tandul(matta rice) and idli rice. I am yet to make appe using boiled rice. I used to make it with urid daal and plain rice must try your version out. I finally have both idli rice and rosematta rice in my pantry so I’ll be trying this recipe very soon! The appe look so delicious. Is there a difference between parboiled rice and boiled rice? Can I use parboiled rice in this recipe? HI !! ukdo tandul… means the red rice used by people in udupi… ? I have a question regarding different types of rice. I was assuming par boiled rice, idli rice and boiled rice are the same. Looks like they are all different. Can you please let me know the difference between each. I followed the recipe but left out the onion. Appe turned out really soft and delicious ! Thank you for a great recipe. Thanks for the delicious recipe. I would like to know if we have to use a seperate kadai for preparing appe’s or can use a non stick pan which is used to make dosas. Thanks for the recipe…Appe turned out very well…. I understand how to make it but we have to deep fry it / fry in a tawa. I visit your site regularly though this is my first comment here. 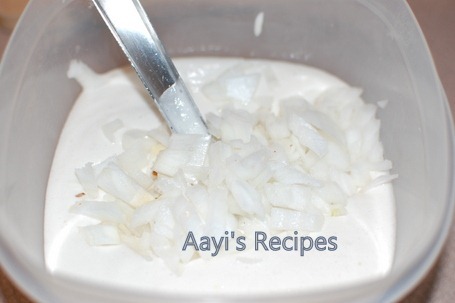 Have tried many of your recipes and they have been a hit at home. Was just browsing ur site today and came across this recipe today. I make this often. 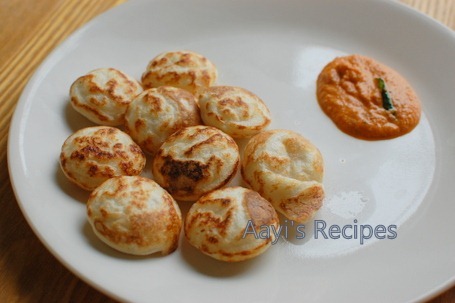 The last time I made these appas (in Tulu, am from Udupi) was yesterday and my son and hubby abosuletly love it especially during the rains when eaten hot either as breakfast or as an evening snack. However, the additions to the batter are slightly different. I add finely chopped ginger, green chillies and coriander leaves. I serve it with coconut chutney. Absolutely yummy!!! My mouth is watering at the very thought of it and its raining cats and dogs outside!!! There is also a sweet version of this wherein you add jaggery ( as per taste) while grinding instead of the onions, chillies et al. how does the appe vessel look like? is it not possible to deep fry or make like dosas?